The Madison-Belmont Building, a transitional style building combining neo-Renaissance with early modern designs, incorporates many ideas from the growing European modern movement. The building was designed by the prominent and traditional New York architectural firm of Warren & Wetmore in an unusual style for this firm, showing a likely influence from the involvement of master iron smith Edgar Brandt as well as by the fact that Whitney Warren was spending considerable time in Paris where new concepts of Art Deco were taking hold. The building was constructed in 1924-25 for the Merchants & Manufacturers Exchange of New York, a development company headed by Robert M. Catts and it was built as office and showroom space for silk companies in the developing Silk District of mid-town Manhattan. The Cheney Silk Company, with headquarters in Manchester, Connecticut, was the building’s major tenant and had its showrooms on the first three floors of the building. Cheney Silk, started by the Cheney Brothers in 1838, was the first successful silk manufacturer in the United States. The company had numerous ties to design developments in France and had already established a relationship with Edgar Brandt, a pioneer in the Art Deco style in Paris early in the 1920s. Brandt designed the iron and bronze framing around the large showrooms of the lower three stories as well as the entrance doors and bulkhead grilles on the exterior of the building. These lower floors have been cited as one of the first instances of Art Deco architectural design in the United States. The upper levels display more traditional ornamental motifs that have been flattened and stylized to reflect the newly emerging modern styles. The building’s shaft has continuous brick piers with recessed spandrels that emphasize the building’s height and a crowning cornice with upper floors marked by over-scaled terra-cotta ornament. These elements were created by the New York Architectural Terra Cotta Company, a firm that worked closely with these architects, and include window-framing pilasters, putti heads and egg and dart moldings that are similar to other Warren & Wetmore buildings but executed in a more modern style. 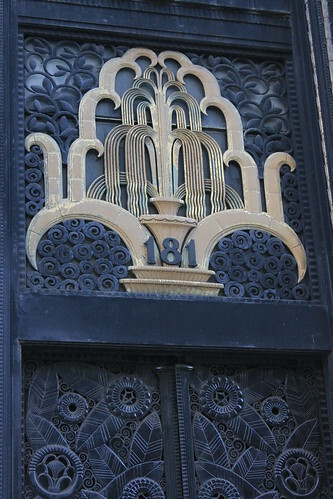 The building has a traditional arrangement of base, shaft and capital, with ornament located in traditional areas, but the broader, more stylized execution of this ornament as well as the unusual and distinctive Art Deco motifs on the three lower floors suggest the new design ideas that were just beginning to penetrate architectural circles in this country, making this an important transitional building between traditional and modern design. The "Silk District" of Manhattan developed in the early 1920s as sales and design businesses related to silk manufacturing moved to or constructed buildings near the intersection of 34th Street and Madison Avenue. Previously most of these companies had been located near Fourth Avenue between 18th and 20th streets. A confluence of real estate activities led to this change. In the late 19th century this section had been developed with mansions set amid lawns and fences for wealthy New Yorkers. The well-known residents of the area included the Phelps family who had a house facing Madison Avenue between 36th and 37th Streets (later purchased by J.P. Morgan), Pierre Lorillard, Jr. who lived at the southwest corner of Madison Avenue and 34th Street and August Belmont who resided across Madison Avenue. Early in the 20th century retail establishments began to move north from Ladies Mile changing the character of all the adjoining areas. The incursion of commercial buildings included the R.H. Macy department store which moved to 34th Street and Broadway in 1901-02, B. Altman’s to 34th and Fifth Avenue in 1905-6, and Tiffany & Company to Fifth and 37th Street in 1903-6, as well as a large office structure, the Cameron Building, constructed on the northeast corner of 34th Street and Madison Avenue. By 1907, the Real Estate Record & Guide reported that "all the blocks between Fifth and Sixth Avenues on Murray Hill are being invaded by retail houses, such as silversmiths, tailors, dressmakers, milliners, etc." These developments hastened the relocation of many people with private homes to areas farther north. This change was also spurred by the construction of Pennsylvania Station and the elevated trains and subways that ran along Sixth Avenue and Third Avenue, making this central area easily accessible by a variety of transportation and thus appealing to many business interests. New York aided this transition by widening Madison Avenue between 23rd and 41st Streets by 5 feet on each side, to relieve traffic congestion in the area. The New York Times reported that "Madison Avenue has finally come into its own and may now take its place alongside of Fifth Avenue as Fifth Avenue’s running mate and as a close second in importance as a business thoroughfare." By 1924, numerous silk companies began to relocate to this area. The New York Times listed several businesses, including Schoolhouse & Co. (that moved to Madison and 39th Street), L. O. Thompson & Co. (moving to 244 Madison Avenue) and a new building under construction on Madison Avenue, near 40th Street to be called the "Silk Building," to house only "concerns in the silk and fabric industry." Central to the new district were two new structures on the corner of Madison Avenue and 34th Street being planned specifically for businesses related to the silk industry. At the southwestern corner the Belding Brothers purchased a plot for the construction of a 16-story building and across Madison Avenue, on the southeastern corner, Robert M. Catts was building a 17-story structure that would house the showrooms of the Cheney Silk Company in its first three floors. Robert M. Catts was a prominent and successful real estate developer in New York. He began his career as president of the Ritz Realty Corporation and later became president of the Merchants & Manufacturers Exchange of New York. He bought, developed and sold several large buildings in the vicinity of Park, Lexington and Madison Avenues during the 1910s and 20s before declaring bankruptcy in 1927. One of his more successful efforts was the Madison Belmont Building that was planned in 1924 and constructed in 1924-25. In June, 1924 Catt’s development company purchased several lots (lots 28, and 57-61, now combined to become lot 60) at the corner of 34th Street and Madison Avenue and extending south to 33rd Street. At the time, these lots were occupied by a series of small taxpayer buildings. By August, Catts had secured a 21-year lease for the major ground-floor showroom on the corner from Cheney Brothers Silk, one of the pre-eminent silk manufacturing firms in this country. Catts, who had employed the prominent architectural firm of Warren & Wetmore for other projects, also awarded this firm the commission for the Madison Belmont Building. Because of the Cheney Brothers connection, however, the architects were to work with the French iron master, Edgar Brandt. Whitney Warren (1864-1943), born to a wealthy family in New York City, studied architecture privately, attended Columbia College for a time, and continued his studies at the Ecole des Beaux-Arts in Paris from 1885 to 1894. Upon his return to New York, he worked in the office of McKim, Mead & White. One of Warren’s country house clients was Charles Delevan Wetmore (1866-1941). Born in Elmira New York, Wetmore was a graduate of Harvard University (1889) and Harvard Law School (1892). He also studied architecture and had designed three dormitory buildings (c. 1890) on that campus before beginning to practice law. Impressed by his client’s architectural ability, Warren persuaded Wetmore to leave the law and to join him in the establishment of the architectural firm Warren & Wetmore in 1898. While Warren was the principal designer of the firm and used his social connections to provide it with clients, Wetmore became the legal and financial specialist. Reflecting his early interest in French design, Whitney Warren was also a founder of the Society of Beaux-Arts Architects and the Beaux-Arts Institute of Design. Warren & Wetmore became a highly successful and prolific architectural firm, known for its designs for hotels, resorts and for buildings commissioned by railroad companies. The firm’s work was concentrated in New York City during the first three decades of the twentieth century, but it also executed projects across the United States and overseas. The designs were mainly variations of the neo-Classical idiom, including essays in the Beaux-Arts and neo-Renaissance styles, but throughout their careers they were able to adapt classical design treatments to the needs of a modern city. Warren & Wetmore’s first major commission, the result of a competition, was the flamboyant New York Yacht Club (1899-1900) at 37 West 44th Street. Early residences by the firm included town houses on the Upper East Side, such as the Marshall Orme Wilson House, 3 East 64th Street (1904-05); the James A. and Florence S. Burden House, 7 East 91st Street (1902-05); and the R. Livingston and Eleanor T. Beeckman House, 854 Fifth Avenue (1903-05). The firm of Warren & Wetmore was responsible for the design of the facades of the Chelsea Piers (1902-10, demolished) along the Hudson River between Little West 12th and West 23rd Streets; the Vanderbilt Hotel (1910-13), 4 Park Avenue, including the Della Robbia Bar (with R. Guastavino Co. and Rookwood Pottery Co.) Aeolian Hall (1912-13) and a number of luxury apartment houses, such as No. 903 Park Avenue (1912). Warren & Wetmore is most notably associated with the design of Grand Central Terminal (1903-13, with Reed & Stem and William J. Wilgus, engineer), East 42nd Street and Park Avenue, as well as a number of hotel and office projects located nearby. Whitney Wetmore was the cousin of William K. Vanderbilt, chairman of the New York Central Railroad, who was responsible for the firm’s selection as chief designers. Nearby structures designed by the firm over the span of two decades included: Hotel Belmont (1905-06, demolished); Ritz- Carlton Hotel (1910, demolished); The Biltmore Hotel (1912-14, significantly altered), Vanderbilt Avenue and East 43rd Street; Park Avenue Viaduct (designed 1912, built 1917-19); Commodore Hotel (1916-19, significantly altered), 125 East 42nd Street; Equitable Trust Co. Building (1917-18), 347- 355 Madison Avenue; Hotel Ambassador (1921, demolished); and New York Central Building (1927-29), 230 Park Avenue. Due to the firm’s success with Grand Central Terminal it received commissions for railroad stations in other cities, for the New York Central, Michigan Central, Canadian Northern, and Erie Railroads. Notable among these are the Fort Gary Station (1909), Winnipeg, Canada; Yonkers Railroad Station (1911); Union Station (1911-12), Houston; and Michigan Central Station (1913-14, with Reed & Stem), Detroit. Later in their careers, the architects became known for their designs for office and apartment buildings, many of which continue to contribute to the streetscape and skyline of Manhattan. Prominent later commissions included the Heckscher Building (1920-21, 730 Fifth Avenue); Plaza Hotel addition (1921, 2 Central Park South); Steinway Hall (1924-25, a designated New York City Landmark); Aeolian Building (1925-27, a designated New York City Landmark); Tower Building (1926, 200 Madison Avenue); Consolidated Edison Co. Building Tower (1926, 4 Irving Place, a designated New York City Landmark); Erlanger Theatre (192627, 246-256 West 44th Street, a designated New York City Landmark and Interior Landmark); and Stewart & Co. Building (1929, demolished, 721-25 Fifth Avenue). The Heckscher, Steinway, Aeolian, and Consolidated Edison Buildings, all designed after the 1916 zoning law was in effect show the firm’s success in its use of setbacks and picturesque towers. Little was constructed by the firm after 1930. Whitney Warren retired from Warren & Wetmore in 1931, but remained a consulting architect. Charles Wetmore was the firm’s senior partner until the end of his life. Started as the Mt. Nebo Silk Mills in Manchester, Connecticut by the three Cheney brothers in 1838, this company engaged in the first successful manufacture of silk in the United States. After others’ failed attempts at growing silk worms and mulberry trees to make silk, Ralph, Ward and Frank Cheney erected a small factory building, used water power from a local river and began the production of sewing silk with silk thread imported from Asia. By 1844 the company began dyeing silk, and in 1847 they patented a machine to make sewing thread. Another major innovation of this firm, in the 1850s, was to create a process by which tangled silk could be spun and used rather than wasted. In 1854, the name of the firm was changed to Cheney Brothers Manufacturing Company and expansion began with the construction of additional buildings on their factory site. The United States imposed a tariff on imported silk goods during the Civil War, and the company prospered, continuing to add products and capacity. By 1916, "the Cheney Mills included over 36 acres of floor space" and by the early 1920s the mills employed 4,700 workers. They manufactured "dress goods, upholstery fabric, tapestry, decorative silks and draperies, neckware, velvets, plushes, thread and yarn." The Cheneys were major supporters of the town of Manchester where they "built firehouses, electric and gas companies, schools, reservoirs, and hundreds of worker houses" as well as churches and other public buildings. Cheney Brothers had their peak year in 1923, after which they suffered a slow decline brought on by the Great Depression, the elimination of protective import tariffs, new fashion trends and the advent of synthetic fibers. The company reorganized in 1935 and their business improved somewhat during World War II with the development and production of nylon parachutes (Pioneer Parachute), but in 1955 the family sold the company to J.P. Stevens. Much of their operations were closed, with production continuing only on velvet fabric, until 1984. During their heyday, the Cheney Brothers boasted that they spent "thousands of dollars yearly . . . [to tell] the purchasing public of the merits and quality of their products." In addition to advertisements in trade papers, women’s and fashion magazines, the company sponsored exhibitions of their products. In 1920, Cheney Hall in Manchester was the site of "the greatest silk exhibit ever seen in New England." This included booths and settings to display the various materials they manufactured, as well as an explanation of how the silk was processed and the various machines used to do it. In 1923, at the Second International Silk Show which took place at the Grand Central Palace in New York, the Cheney Bothers’ exhibit showed "French, Fantastique and Baroque silks" set in elaborate rooms, and was said to be worth $250,000. Edgar Brandt was "considered the greatest exponent of Art Deco metal work" in the world. Born in Paris in 1880, Brandt studied traditional forging at the Ecole Professionel de Vierzon. He was greatly influenced stylistically by the pioneering work of Emile Robert who moved decorative ironwork toward more modern design. Brandt’s early work reflected the Art Nouveau style, popular during the early years of the 20th century, often using forms from nature including leaves, flowers and animals. By 1920 his work became more stylized, sometimes with angular Art Deco motifs but still incorporating natural forms. His wide body of work ranges from structural pieces such as gateways, grills, radiator covers, railings and elevator doors, to smaller decorative objects such as lamps, sconces, consoles, screens and chairs. He also created numerous small pieces of jewelry, vases, and sculptures. His work received the Gold Medal First Class at the Salon des Artistes Fran9ais in 1908 and the Medal d’ Honnour for Applied Art by the Societe des Artistes in 1923, and he became a Knight of the Legion of Honor in 1926. In addition to his artistic work, Brandt designed and manufactured several important weapons, including an extremely precise air pressure mortar that stood on three legs and other armaments that were used by the French Government during the First and Second World Wars. In 1926 he founded the Societe des Etablissements Brandt to distinguish the arms manufacturer from his other work. Brandt also designed war memorials in Verdun and Compiegne as well as the housing for the eternal flame under the Arc de Triomphe in Paris. One of Brandt’s main contributions to his field was his ability to combine his artistic goals with the emerging industrial methods of ironwork, such as torch welding and power hammers. He borrowed concepts about the industrial division of labor from the automobile industry and in his factories he created a system whereby different sections of a work were made in different workshops and then assembled and finished together to produce luxury works of art. Brandt’s first American client was George G. Booth, wealthy founder and donor to the Detroit Society of Arts and Crafts and the Detroit School of Design, as well as the president of the Board of Trustees of the Detroit Museum of Art. On a trip to Paris in 1921, Booth and his wife purchased 18 items from Brandt’s showroom, including a door and several mirror frames. Several of these were intended for display at the Detroit Museum. In 1925, the Booths purchased several other pieces from Brandt to display at the Cranbrook Academy of Art, a school they were starting in Bloomfield Hills, Michigan. These examples provided an introduction for Brandt’s work to an American audience and led to other commissions. Brandt was a major contributor to the Exposition Internationale des Arts Decoratifs et Industriels Modernes in Paris in 1925. This exhibition introduced new, modern design concepts to an American audience that was largely unaware of such European developments. Many countries had exhibits at the show, but the displays provided by France were a revelation to American designers at the time. The artists and craftsmen who represented France were required by the government to show art that was "not dependent upon the art of the past." The fair was held in a large site in the middle of Paris, surrounded by 18 gateways, designed by Edgar Brandt. His wrought-iron entrance gates for the "Porte d’Honneur" "set a tone of modernity and technical virtuosity" for the entire exhibition. They were composed of geometric and natural shapes such as spirals and flattened flowers and leaves that were significantly more simplified than had been commonly used. Influenced by the recent discovery of Tutankhamen’s tomb in Egypt, Brandt included fans, lotus, lily and papyrus forms in his work as well. He also had numerous other displays throughout the fair and his work fully expressed the new style of design that would come to be called Art Deco. The United States sent a large delegation, called the Hoover Commission, to gather information for American designers and manufacturers. Their report to Secretary of Commerce Herbert Hoover was well publicized and helped spread the news of the modern styles and some of the artists whose work was on display. The 52-member commission commented on the great amount of forged ironwork at the fair, noting that the work of Edgar Brandt was the best of all that displayed. The publicity generated by the 1925 Paris fair finally spurred an interest in modern decorative art in America. After the fair, the Shumacher Fabric Company created several designs inspired by Brandt, commissioned an Art Deco room for its New York showroom, and had Brandt contribute several pieces to it. Other exhibits of Art Deco interiors (including work by Brandt) took place at the gallery of Jacques Seligmann in February and March, 1926, as well as in the Art and Trades Club, and W. & J. Sloane. The Metropolitan Museum had a showing of selected objects from the 1925 Paris Expositions in March 1926. Edgar Brandt, through his short-lived New York office called Ferrobrandt, received many other American commissions. His American work included an entrance facade for a commercial building on West 39th Street, and a fire screen for the Thomas Fortune Ryan Residence at 32 East 70th Street and a dining room for Miss Agnes Miles Carpenter at her home at 950 Fifth Avenue. I saw his work in Paris . . . and I noticed in his work there was something new and something old. . . He obtains his inspiration from the ancients and interprets them in forms that are more suggestive of the dynamic force of today. . .
September, 1924, and shown in an elaborate display in Cheney’s New York showroom. The display included a Brandt iron entrance door draped with silk, as well as several Brandt fire screens and gates that served as displays for silk fabric. Because of the success of this exhibit Cheney Brothers silks were chosen to be among the first American products shown in the decorative arts section of the Louvre in February and March 1925, in an exhibition entitled "Exposition France-Etats Unis." Once Cheney Silk signed the lease for three floors of showrooms and basement storage in the Madison Belmont Building, they brought in Edgar Brandt to contribute to the design of the new building (as well as for their showrooms). Whether it was because of Brandt’s influence or Warren’s awareness of contemporary design trends in France during this period, this building is different from much of the firm’s other work, and includes numerous design elements that reflect the modern movement then gaining strength in Europe. Warren & Wetmore, while known for their French-influenced, classical designs, were also quite able to adapt to the needs of their individual clients in a manner that shows a progressive tendency not always evident among their contemporaries. A transitional style building, the Madison Belmont Building straddles the line between classical and early modern design. It includes the firm’s classical structure of base, shaft and capital, with a strongly projecting cornice and a typically picturesque roofline, but many details display a decidedly modern cast. As in several of their other office towers from the early 1920s, such as the Heckscher Building (730 Fifth Avenue) and the Tower Building (200 Madison Avenue) the shaft of the building has continuous brick piers above the base with darker, recessed spandrels that appear to recede, emphasizing the building’s height. The use of color in the building is also not traditional. Rather than cladding the building in traditional stone, it is faced in variegated pink brick, with red metal window frames, contrasting spandrel bricks, all of which are significantly different from the stone and metal base materials. The spandrels are faced with multi-toned brick laid in a basket-weave pattern, typical of the Art Deco style. Texture on the surface of the structure is very important as well. Terra-cotta panels of diamond-point rustication flank the fourth story windows while flat pilasters covered in terra-cotta diaper work frame the windows of the 17th story. Additionally, on the 4th story above the base, and the upper stories, above and below the main cornice, there is an abundance of classically-themed ornament typical of the work of Warren & Wetmore. This terra-cotta ornament, created by the New York Architectural Terra Cotta Company, which the firm used for many of its buildings, displays traditional motifs such as pediments with garlands and fruit, putti heads, and fleurs-de-lys. In this building, however, these designs are rendered in a simplified, flattened manner, different from the carefully proportioned designs seen on most Warren & Wetmore buildings. The egg- and-dart motif on the cornice is quite broad, and the engaged colonnettes flanking the windows of the 15th floor are short and wide, a clear contrast to the ornament that graced the top of some of Warren & Wetmore’s earlier designs, such as that for the now-demolished Hotel Chatham. The three-story base of this building is quite distinct from the upper floors. Faced with granite, the lower floors are almost completely filled by large display windows, somewhat similar to what Warren & Wetmore designed for the Stewart & Co, Building (402 Fifth Avenue, a designated New York City Landmark). At the Madison Belmont, however, the display windows are highlighted by Brandt’s unique iron and gilded bronze frames that rise uninterrupted for the first three floors. Brandt also created unusual iron grates with geometric motifs beneath the large first floor windows, and a set of iron doors featuring leaves and other natural motifs that fronted the entrance to the Cheney Silk showroom on Madison Avenue. Both the building entrance on 34th Street and the store entrance on Madison Avenue are given prominence by decorative black and gold transoms enhanced by stylized gold fountains. This "frozen fountain" motif later became almost synonymous with Art Deco architecture in this country. Brandt’s designs for the lower floors of the building represent one of the first instances of the application of Art Deco design to a building in America. Historic: Lowest 3 stories have granite facing with large glass display windows; decorative iron grates below 1st story windows; continuous iron framework around windows; red spandrel panels between first and second story windows (later addition, date unknown); main entrance in easternmost bay, with bronze-and-glass entry doors; large iron-and-bronze decorative transom; narrow pink brick facing upper stories; rectangular, double-hung, red metal 1/1 sash windows with brick sills; 5th through 15th story continuous brick piers with recessed spandrels of varied colored brick in basket pattern; 4th story has terra-cotta pediments and flanking panels of terracotta blocks in diamond-point rustication pattern; 15th story has terra-cotta ornament surrounding windows; ornate terra-cotta cornice above 15th story; terra-cotta ornament around windows of 16th and 17th stories. Historic: 3-story base with granite facing; two outside bays of large glass display windows with continuous framing; recessed entrance door with iron and bronze transom; flanking decorative iron entrance gates, open and flat against reveal of entrance; smaller windows above center entrance bay; brick facing above 3r story, with decorative motifs same as 34th Street facade; 5 bays at street plane; recessed western facade and southern facade are faced with plain, dark brick, plain, paired rectangular windows with red metal sash; no ornamentation. Alterations: Store entrance door and surround replaced; entry gates fixed permanently to sides of entrance. stories to a decorative cornice, and then set back slightly for two floors, with mechanical equipment on roof. Alterations: Metal grate at lot line of 1st story; standing siamese hydrant near each corner of building; security camera attached near eastern edge of top of 1st story wall.